The officer who accepted General Cornwallis’s sword was American general, Benjamin Lincoln. 1756: married Mary Cushing; they would have 11 children. In 1776 Benjamin Lincoln was promoted to major general of the Massachusetts militia; he worked on the coastal defenses, and forced the last British ships to leave Boston Harbor as the English evacuated the city. Although he had experience in militia command, the Continental Congress was reluctant to give Lincoln a commission in their army because he lacked battlefield experience. September 1776: Lincoln lead a brigade of militia and joined General Washington’s army in New York. In February 1777 the Continental Congress sent Benjamin Lincoln a major general’s commission – unfortunately he was defeated in a surprise attack two months later at the Battle of Bound Brook. During the military movements around Saratoga in the summer and autumn of 1777, Lincoln and his troops played an important (but often overlooked role) in leading to the capture of the post and surrender of British General John Burgoyne. Victories come with a cost – Benjamin Lincoln was wounded and sent home. He worried that the army didn’t need or want him anymore, but General Washington reassured him. By August 1778 Lincoln was back with the armies and was sent to the Southern theater of fighting (see N. Greene’s biography for more details). Lincoln participated in the attempted siege of Savannah, Georgia and then retreated to Charleston, South Carolina. In May 1780 Lincoln was forced to surrender Charleston and 5,000 troops to General Clinton after a three month siege. He was denied the honors of surrendering formally. Lincoln was eventually paroled and exchanged; no charges of disloyalty, mismanagement or neglect were ever brought against Lincoln in a court of inquiry. General Washington trusted Lincoln. In the campaign and siege of Yorktown, Lincoln’s troops played a large role. On October 19, 1781, the British under General Cornwallis surrendered after the siege of Yorktown. General Cornwallis – deeply humiliated – refused to attend the surrender ceremony and sent General O’Hara with the commander’s sword. General Washington summoned Lincoln to take the sword. Thus the general who was denied the honor of a proper surrender was the one the British commanders technically surrendered to. (There is some debate among historians: did Lincoln actually take the sword or did he hold it and then return it to O’Hara?). While America was governed by the Articles of Confederation, Lincoln served as Secretary of War from 1781-1783. In 1787 Lincoln led the ratification of the US Constitution in his home-state (Massachusetts). He understood the importance of national unity since he had been one of the military commanders to end Shays’s Rebellion earlier in the year. He did receive electoral votes for president in the first election. Served as Lieutenant Governor of Massachusetts and Collector of Port of Boston. 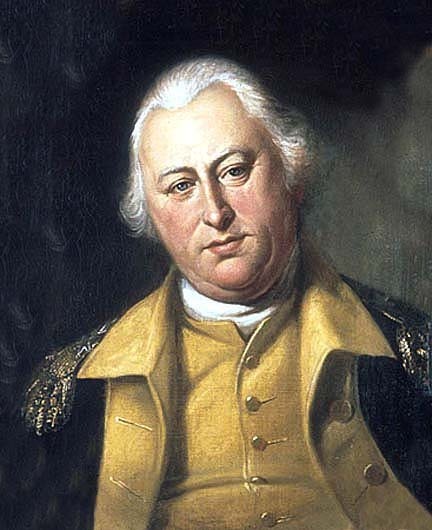 Benjamin Lincoln is one the early American military commanders often neglected in the history books. He didn’t have the slyness of Francis Marion, the victories of George Washington, or the scandals of Benedict Arnold. Yet Lincoln was a steady and reliable commander. He took part in military campaigns that led to the surrenders to two large British armies (Saratoga and Yorktown). However, I think the best testimony of his loyal character is found in the aftermath of Charleston. Forced to surrender, he returned to Washington’s Army, likely feeling worried, ashamed, and unsure what would happen. And he’s welcomed back with no formal questions or court marshals. Other generals in the same war surrendered (or were defeated) and faced disgrace: not Lincoln. It seems that his peers understood the desperate situation in Charleston and that he would not have surrendered unless there was no other option. His loyalty was never questioned. This shows the true patriot. Thus, although Benjamin Lincoln faced great difficulties and even defeat and surrender, his trustworthiness and dependability were well-known and he continued as a leader through the rest of the war and the in government formations years of America. P.S. Look for some new features and changes to Gazette655 in the next couple of weeks. And, as always, leave your questions or comments about this post!